A transformative gift of $10 million from the Irving Ludmer Family Foundation in support of the Ludmer Centre for Neuroinformatics & Mental Health will expand the Centre’s internationally renowned role in brain research and establish a Global Brain Consortium of leading research institutions. The consortium will focus on sharing research methodologies and results, with the goal of accelerating the finding of novel and ground-breaking solutions to mental health and neurodegenerative diseases. The $10-million Ludmer Centre Heritage Fund will also support the Ludmer Centre’s mandate to advance a big-data approach to brain research, and to boost the work of emerging young researchers at the Centre. The gift brings the Ludmer Family Foundation’s total support of the Ludmer Centre to $18 million. The Ludmer Centre for Neuroinformatics & Mental Health was established in 2013 as a partnership between the Montreal Neurological Institute and Hospital (The Neuro), the Douglas Mental Health University Institute, and the Jewish General Hospital’s Lady Davis Institute for Medical Research to improve the prevention, diagnosis and treatment of mental disorders through innovative research. According to the Canadian Mental Health Association, in any given year, one in five Canadians will experience a mental health problem or illness. “For 30 years, we’ve been building one of the largest neuroscience infrastructures in the world at McGill,” said Alan Evans, one of three co-directors of the Ludmer Centre. Evans is a James McGill Professor in Neurology and Neurosurgery at The Neuro, the holder of the Victor Dahdeleh Chair in Neurosciences, and scientific director of both the Canadian Open Neuroscience Platform and McGill’s Healthy Brains for Healthy Lives initiative, which seeks to advance understanding of how the individual brain functions in health and disease and is supported by $84 million in funding from the Government of Canada, and $18 million from the Government of Quebec. “The Global Brain Consortium will use the principles and practices of open science, which have been developed at The Neuro, to assemble complementary expertise from around the world in addressing the big questions in neuroscience.” Open science is a means to expand the impact of research by sharing it with a global community to accelerate the pace of neuroscience discovery. To bring the Global Brain Consortium to life, next fall the Ludmer Centre will create a steering committee of five to eight top global experts who cover a complementary set of scientific domains. They will lead the design and organization of an international workshop in spring 2019. “Today the world is ready to do things for those struggling with mental health and neurodegenerative disorders. 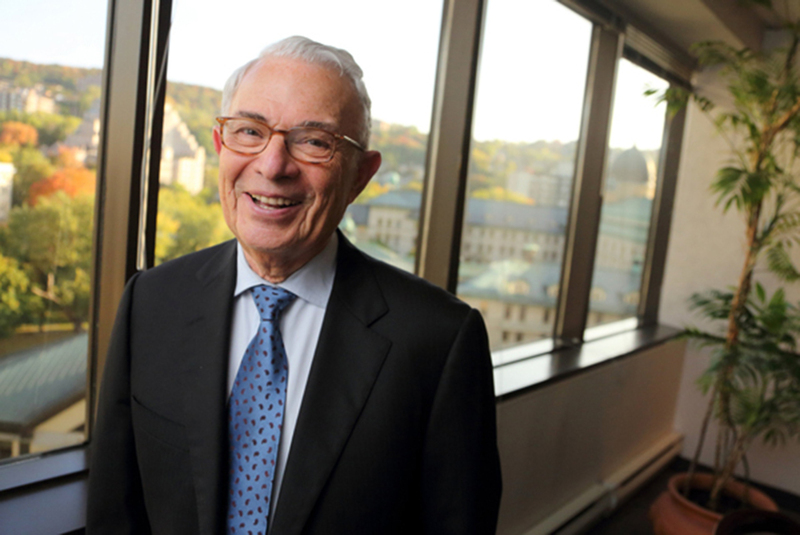 There isn’t a family that hasn’t been touched by this issue,” said Irving Ludmer, BEng’57, president of the Irving Ludmer Family Foundation, and a long-time supporter of McGill. The Ludmer Centre’s directors are leading scientists in their respective fields. A scientific director at the Centre and a world authority on epigenetics and mental health, Michael Meaney is a James McGill Professor in Psychiatry, director of the Sackler Program for Epigenetics & Psychobiology, a senior researcher at the Douglas Mental Health University Institute and a thematic lead for Healthy Brains for Health Lives. An expert in quantitative-life-sciences statistics, Celia Greenwood, also a scientific director at the Ludmer, is a senior scientist at the Lady Davis Institute. At McGill, she’s a professor in the Gerald Bronfman Department of Oncology, jointly appointed to Epidemiology, Biostatistics & Occupational Health, and graduate program director of the new Quantitative Life Sciences PhD program. The Ludmer Centre is attracting up-and-coming researchers working in areas like Alzheimer’s disease, maternal mental health and depression. These researchers include Rosemary Bagot, PhD’11, a William Dawson Scholar and assistant professor in Psychology. At Bagot’s multidisciplinary Behavioural Neurogenomics Laboratory, researchers look at the mechanisms and nature of susceptibility to depression, including the role of stress. The Ludmer Centre for Neuroinformatics & Mental Health, with the promising potentials of big-data research, envisages a future where mental illnesses, cognitive disorders and learning disabilities are significantly reduced through preventive strategies and their diagnoses, which, based on biological metrics, lead to more effective, individually-tailored treatment approaches. Our mission is to establish the Ludmer Centre as a global centre of excellence and an incubator for neuroinformatics, genetics and epigenetics (big data) research and training, thereby, increasing multi-, inter- and trans-disciplinary big-data mental-health research to advance the prevention, diagnosis and treatment of mental disorders: mental illnesses, cognitive disorders and learning disabilities.